The method of rubbing or “cutting” fat into flour, then stirring in moisture before kneading is referred to as the “biscuit” method and is called for in the preparation of many baked goods, most notably scones, shortbread and pie crusts. I never really thought I could beat my grandmother’s biscuits. Since she passed away, though, I’ve come close if for no other reason than that I realized that her arthritis was actually an ingredient. Her fingers hurt so much she couldn’t really bend them when she kneaded the dough. When I started imitating her movements, my biscuits got better. 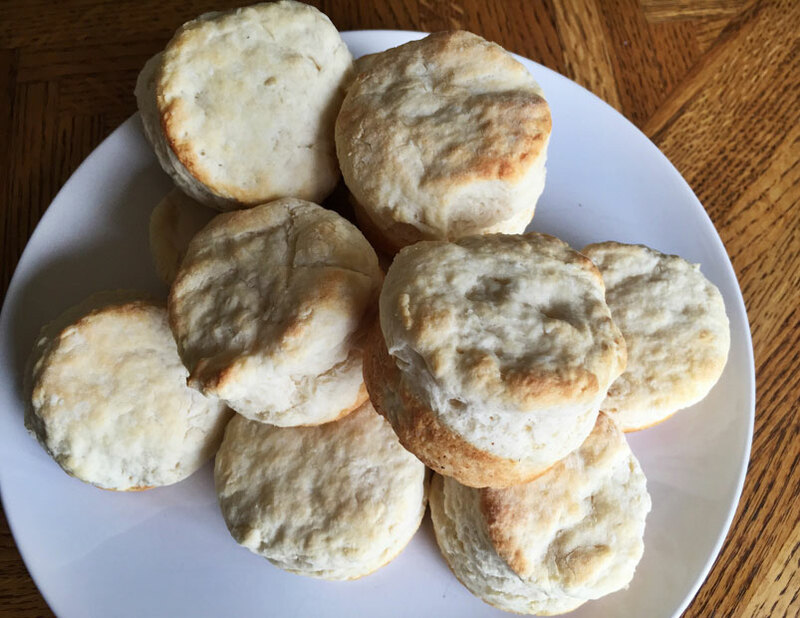 The key to a good, light, Southern-style biscuit is “soft” flour — a flour that contains less protein than bread flour or even all-purpose flour. Some popular Southern flours are also milled to a finer grain consistency, which aids in fast mixing, another contributor to lightness. If you don’t have access to soft Southern flour (which you can now buy online), you can approximate it by mixing three parts all-purpose flour with one part cake flour. Whisk together all the dry, powdery stuff (except the flour for dusting, of course) in a large mixing bowl. Using your fingertips, rub the butter and shortening into the dry goods until the mixture resembles coarse crumbs. Make a well in the middle of this mixture and pour in the buttermilk. Stir with a large spoon until the dough just comes together. Then knead in the bowl until all the flour has been taken up. Turn the dough out onto a lightly floured surface, then start folding the dough over on itself, gently kneading for 30 seconds, or until the dough is soft and smooth. Press the dough into a 1-inch-thick round. Using a 3-inch round cutter, cut out biscuits, being sure to push the cutter all the way through the dough to the work surface before twisting to "punch" out the biscuit. Make your cuts as close together as possible to limit waste. Place the biscuits on a half sheet pan (preferably aluminum, which is highly conductive) so that they just barely touch. Reroll scraps and punch out as many biscuits as possible. Use your thumb to create a shallow dimple in the top center of each biscuit**, and bake until the biscuits are tall and light gold on top, 15 to 20 minutes. Turn the biscuits out into a kitchen towel-lined basket and let cool for several minutes before buttering and devouring. *If you're "hot handed" you definitely want to chill the fats in the freezer before attempting to cut them in. **This helps to ensure flat tops on the finished biscuit. This recipe doesn’t jibe with Alton ‘s Southern Biscuit recipe on food network. Flour amount is different, shortening to butter is different, and the baking temp is different. Which one is correct? Please clarify if the flour is measured by weight. Great recipe. Simple. I think the given temperature of 400 F is too low. When I made these (elevation is 800 ft above sea level), after 15 minutes at 400, the biscuits didn’t have any color on top. Anybody else tried other temperatures? I think I’m going to use 450 next time. I’ve never been able to make a satisfactory biscuit until today, with this recipe. HOOOORAAAAAYYY!!! I folded and kneaded, but not too much. Used the mix of AP and cake flour and well chilled fats. Came out perfect! I love this recipe, but I’ve had to reduce the buttermilk by about one or two ounces. I don’t know if it’s because I make it while the kitchen is hot, but the dough always sticks to my hands and countertop now matter how much I flour them, no less the bowl. I use soft wheat flour instead of AP so that might be it, but I’m not too sure. Either way, once I manage to cut them out, they’re delicious. The way I altered this recipe with terrific results is I only use cake flour, I substitute 2 oz of margarine for the shortening, I always chill the dry goods in the freezer for 10 minutes before rubbing in the fats (with my arthritis – its a gentle rub), I butter the heck out of my 1/2 sheet baking pan, I preheat to 450 F, I bake for 11 minutes then pull the biscuits out, switch to broil, lather the tops with melted butter then back under the broiler for 2 to 2 and a half minutes. Wasn’t there an episode where you had a bake off / biscuits making against your mother or grandmother? I’d love to see that again. Old school verse science. Loved it. Any suggestions on making them gluten free? We attempted them with a 1 to 1 gf flour and got hockey pucks! There are quite a few gluten free recipes online using 1 to 1 gluten free flour. I believe you can use the same technique. Hope that helps. I think she wants to know a recommend flour replacement for *this* recipe, not a “go find another recipe” advice. Given that this is a low protein flour blend, you’d want to chose your gluten free blend to be lower in protein-containing flours (brown rice, chickpea, almond). You’ll probably need to build something based on white rice flour and corn starch, and maybe even have to blend the flour from scratch, although I think Cup4Cup brand is low protein, particularly if you can find their “cake” flour. I think Manini’s (Pacific Northwest only) has a low-protein blend as well. I watched my grandmother make biscuits for years when I was growing up. This is a calculated carbon copy of what she used to do. I love this recipe and it takes me back to a Tennysonian spot in time. The only difference is she would take a little bit of grease (animal fat) in her hand and rub it into her flour mixture until she had a little biscuit ball. Thanks Alton for recapturing this true recipe as, like most old fashioned recipes, her’s were scribbles on a paper of ingredients and the technique was hard-learned. I have tried these twice now, and while I am no expert, they keep coming out like hockey pucks. I was under the impression these would make a fluffy, flaky biscuit. The first time i made them I used older ingredients and didn’t weigh the flour. The next time I weighed the flour and purchased all new ingredients; same results. Any ideas? The folding of the dough is paramount. I folded it over 6 times, touching the dough as little as possible. Maybe your fat is melting on the counter instead of in the oven? Hot hands? I still get antsy when I think of using shortening… I just don’t want the Trans Fats. But I’ve had good luck using homemade lard (and I’ve been using the method you did a video on in the Iron Chef kitchen I saw on Food Network.com). As for the flour, I have been using all cake flour… and I thought they came out well. Does the mixture of AP make that much of a difference? Your recipe food network offers is identical, except calls for 2 cups of flour…which is it? I believe in measuring flours by weight, rather than volume. AB is my “go to” when researching culinary experiments.